A week ago I saw a live performance of the Amazing Stroopwafels. The first song they performed was also their most famous one: 'Oude Maasweg'. It's not a habit on this blog to write about songs in the Dutch language, but for this one I'll gladly make an exception. And it's bilingual anyway: one verse is in Dutch, the other verse is in English. It's worth a listen now that you get a chance. By their own admission, they have performed live hundreds of times and released dozens of singles, but it never led to huge amounts of success. 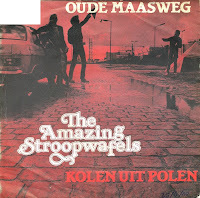 'Oude Maasweg' narrowly missed the Dutch Top 40 in January 1982. However, it has become one of the nation's best loved classics.